Institutional ownership of large-cap stocks is currently at high levels, but there is one glaring exception to that trend: Apple, which is currently at a five-year low among hedge funds, banks, mutual funds, and other powerful types of financial institutions. Morgan Stanley has polled ownership data since 2009 and found that the top 30 shareholders of large-cap companies tend to own between 30 and 50 percent of a company's total shares. While some companies, such as Google, Microsoft and Amazon, are currently at near-record highs for institutional ownership in the last five years, Apple is actually at its lowest level since 2009. Analyst Katy Huberty found that Apple's current top 30 ownership share is at just 30 percent, compared to a 36 percent five-year average, and a peak of 40 percent in 2009. She said this is a sign that institutional investors are currently underweight on Apple as compared to its large-cap peers. "(Institutional investors) hold less concentrated positions in Apple than in the past with the top 30 holders allocating 2.2% of their fund to AAPL, compared to a high of 4.1% in the last five years and Apple's current 2.9% weighting in the S&P 500," Huberty wrote in a note to investors provided to AppleInsider on Wednesday. "By comparison, institutional funds are overweight (on) all other large cap technology stocks in our analysis." 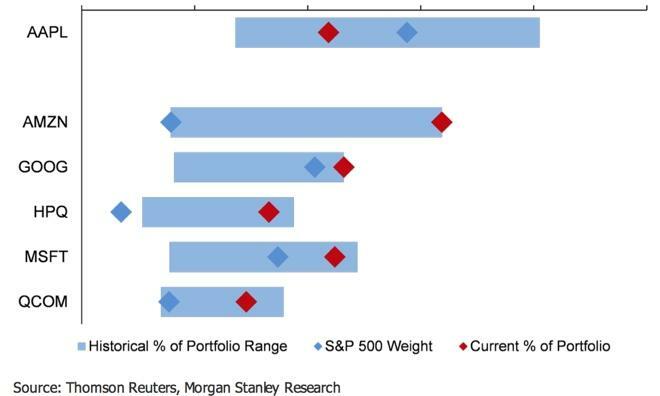 Morgan Stanley found that the current institutional ownership average among S&P 500 companies is at 83 percent of shares outstanding. It's also increasing at a rate of 80 basis points per year, as individuals increasingly sell their single stocks and buy into mutual funds. Another company that, like Apple, bucks the trend of higher institutional ownership is electric car maker Tesla. Coincidentally, it was revealed earlier this month that the two companies secretly met to talk about undisclosed matters. Huberty believes that low institutional ownership of Apple, when compared to other large-cap mobile technology stocks, shows that investors are underestimating the iPhone maker's ability to grow and expand into new markets. For example, she sees growth potential in wearable electronics, as well as new services that Apple could provide with its existing ecosystem of hardware and software. For example, she believes the launch of a so-called "iWatch" from Apple could generate $17.5 billion from existing iPhone owners in the first year alone. The analyst's projections call for sales of between 32 million and 58 million units in the first 12 months of availability. Other potential opportunities for Apple cited by Huberty include mobile payments and advertising services. She sees Apple's Touch ID fingerprint sensor and 64-bit A7 processor, along with the company's nearly 600 million App Store accounts and 380 million Bluetooth Low Energy devices on the market, as having laid the groundwork for such services to debut in the future. Morgan Stanley has maintained its "overweight" rating on AAPL stock with a price target of $630.